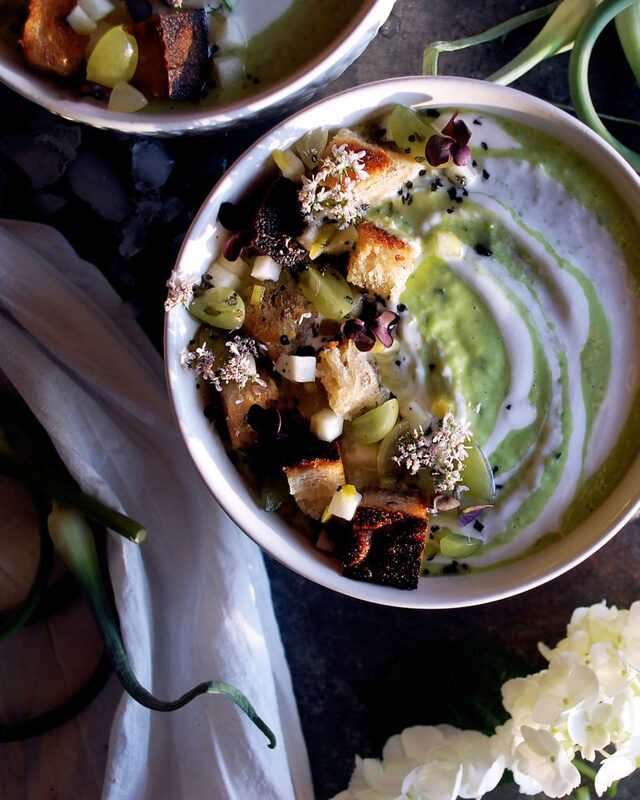 I love taking a classic dish and putting a new spin on it…exactly like I did with this green grape & garlic scape gazpacho. Traditional gazpacho is a Spanish soup made of raw vegetables, with tomatoes being the base. It’s a refreshing soup that is served chilled. I absolutely adore it. Especially when tomatoes are perfectly ripe and at the peak of their season…you cannot beat it. The inspiration for this recipe came from the garlic scapes. I had found a few beautiful bunches of them at the farmer’s market. After grilling them for this potato salad, creating a garlicky pesto, and simply sautéing them with vegetables, I still had a few left. Gazpacho sounded like the perfect way to use them up. 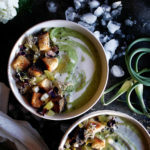 Just like hot soups are extremely comforting in the winter months, I think chilled soups are just as nice for the hot summer months. On top of the garlic scapes, I’ve added green grapes, apple, and beautiful heirloom tomatoes. Cucumbers keep the flavor refreshing, while the Anaheim peppers add a little heat. Another non-traditional ingredient is the avocado. 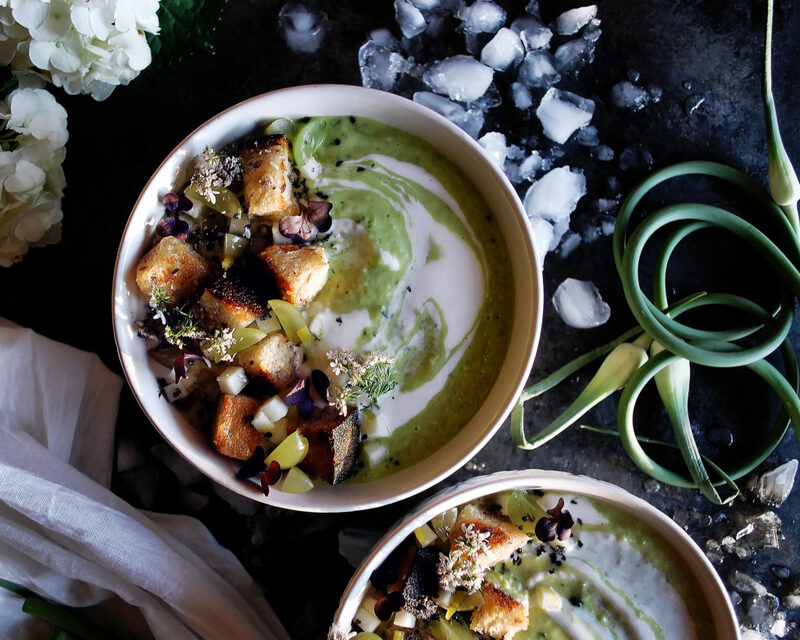 I just like how creamy it makes the soup, while also adding even more vibrant green color. I coat everything in Greek yogurt, which is nice and tangy, and also contributes to a beautiful texture. Any good gazpacho needs acid. I use both white wine vinegar and lemon juice. There’s something about the combination of raw fruits and vegetables, plus brightness from the acid. It is so unbelievably refreshing. I just love the texture, too. 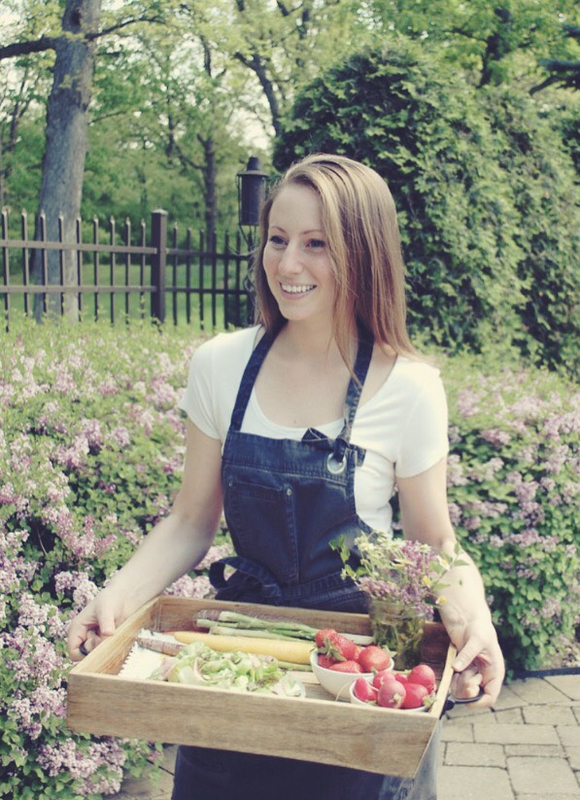 The soup gets blended, but retains plenty of texture from all of the fruits and vegetables. It’s very rustic. And any rustic soup needs some homemade croutons for the top, plus some other wonderful garnishes. I make some simple pickles using ingredients from the soup. I thin out Greek yogurt with lemon juice to drizzle over top. And I add a pinch of black Hawaiian salt to bring out all of the flavors. Enjoy! Roughly chop all of the fruits and vegetables, and place in a large mixing bowl. Add the greek yogurt, lemon juice, white wine vinegar, and basil. Mix well until fully incorporated. Let the mixture chill for at least 30 minutes. Blend the soup in two batches, adding ½ cup of olive oil and 2-3 tablespoons of water to each batch. 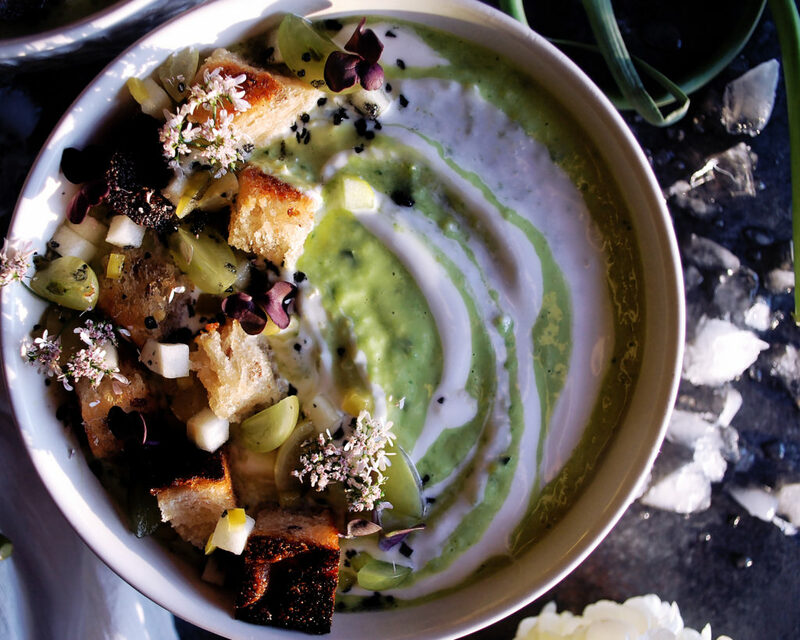 The gazpacho should be creamy, yet still slightly chunky from the fruits and vegetables. Season each batch to taste. Keep chilled until ready to serve. While the gazpacho mixture chills, combine the sugar, white wine vinegar, and water in a small saucepan over medium high heat. Bring the mixture to a simmer, allowing the sugar to dissolve. Put the grapes, apples, and peppers in a small mixing bowl and pour the liquid over top. Use a paper towel or piece of plastic wrap to submerge the ingredients into the liquid. Let sit for 30 minutes. In a large sauté pan, add a very generous amount of oil and heat over medium heat. When the oil is hot, add the bread. Continually stir the bread while it slowly toasts. It should be golden brown and crispy on all sides, yet soft on the inside. Use a slotted spoon to remove the bread from the pan and transfer it to a paper towel lined plate. Immediately season with salt. Whisk together the yogurt and lemon juice until it is smooth. 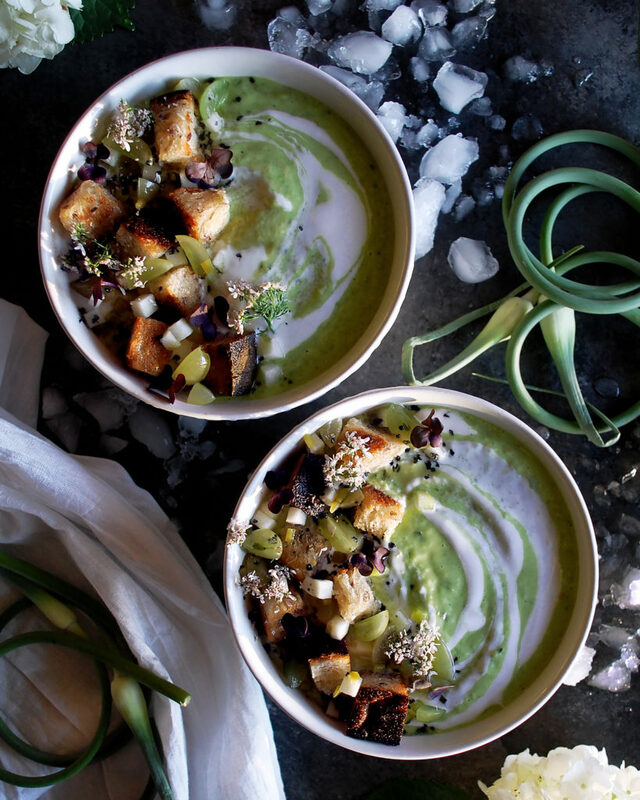 Ladle the gazpacho into bowls. Drizzle the lemon yogurt on top. Add a few croutons and a pinch of the pickles. Garnish with the micro radish, cilantro flowers, and black salt. Serve chilled.